For the last fifteen years, Leigh and I have hosted guests at Walker Creek Retreat from all over the country who come to our area to unwind and enjoy the outdoors. Giles County and the New River Valley are located in the heart of the Blue Ridge Mountains in Southwest Virginia and provide a plethora of outdoor activities for those looking to escape the hustle and bustle of everyday life. There is so much to do here, so we wanted to share with you a great sample of a three-day, three-night, do-it-yourself adventure you can enjoy while staying with us this summer. After you get checked-in and unpacked, you can mosey down to the creek for a short swim in the cool, pristine waters of Walker Creek, one of the area’s best-kept secrets. Although there are dinner options galore, we recommend campfire s’mores for dessert to top off the evening. Tips: Bring some extra lawn chairs to keep around the fire pit during your stay. Food Lion, Grant’s, and Wal-Mart are all conveniently located on the way to the cabin for all your grocery supplies. After breakfast, adventure awaits. You can travel about 15 min to the Cascades Recreational Area and make the two-mile moderate hike up to one of the most beautiful waterfalls in Virginia. 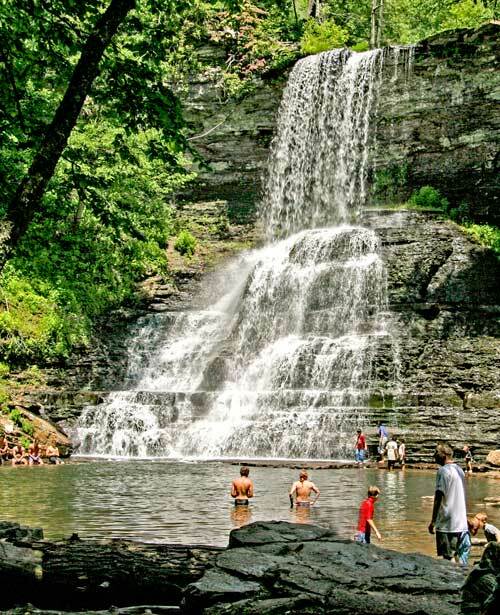 Routinely voted one of the best swimming holes in the Southeast, be ready for a cool but refreshing swim under the magnificent cascading falls. Tips: Pack your lunch for a picnic and take some dry clothes to change into to hike the return potion of the trail. Remember to be extra careful, as the water can be deep and currents deceiving if you are not prepared for it. Plan on a total of 4-5 hrs. After your hike, you can take a long nap back at the cabin in one of our hammocks, porch swings, or just find a shade tree and sleep to the beautiful sounds of the creek. Later in the afternoon, you can use our tubes to make multiple runs on the creek right in front of the cabin or grab a rod and make a few casts for smallmouth or rock bass. For dinner, look no further than the Palisades Restaurant just a short 10-min trek from the cabin. Tip: If you like seafood, make sure the request the Spicy Shrimp Dip for your appetizer at dinner. And, save room for dessert! You can sleep in and relax at the cabin in the morning while catching lunch at Papa’s Pizzeria & Subs in downtown Pearisburg. Then, hit the world-famous and second-oldest river in the world, the New River, in the afternoon. Britt or Leigh can pick you up at your cabin with your choice of canoes or kayaks and shuttle you to and from the river. The New River is famous for its brilliant scenery, great smallmouth bass fishing, and excellent paddling. 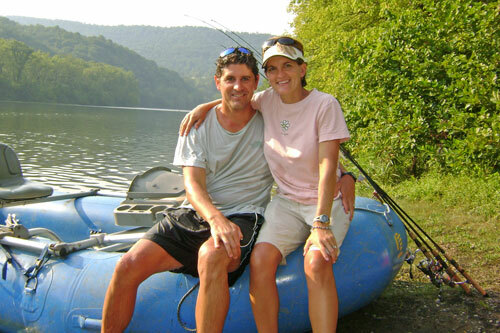 Tips: Try to make reservations for your New River trip at check-in, if not before. Trips run 2-4 hours depending on water flow. Eggleston to Pembroke features the Palisade Cliffs, Caesar’s Arch and Horseshoe Bend with several Class I and II riffles and rapids. After your float, you can grill out and enjoy your dinner al fresco on the porch, deck, or under the pavilion (depending on which cabin you are staying in) while enjoying one last evening on the creek before you head back home the next day. Tips: Make sure to bring your own charcoal. J&J Grocery, located where Route 100 crosses Walker Creek and very near the cabins, has some great choice cut steaks for your cook out, homemade sides & desserts and other limited grocery supplies.